When viewing films, for the most part I prefer to judge each movie on its own individual merits - what they are, rather than what they are not. 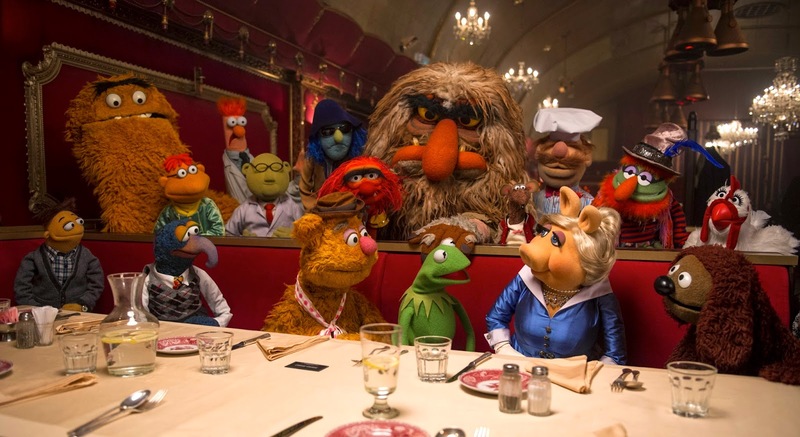 In the case of Muppets Most Wanted, however, this may be impossible; the large shadow of its incredible prequel, The Muppets, looms large as an elephant in the room which James Bobin does well to address from the onset. A song, "They've Ordered A Sequel", acts as both an introduction and warning of sorts to the movie about to follow - "Everyone knows the sequel's never quite as good" croons Kermit in a gag-packed opening lament. As the end credit rolls, we nod our head in retrospective agreement. Following on directly from The Muppets, Most Wanted is the story of what happens after the gang have reformed for their reunion show. A world tour, it is suggested, is the inevitable next step - an idea by the Swedish Chef to make an existential movie in which he plays chess with death is suprisingly shot down. The throwaway gag may be the highlight of the entire film for many cinephiles. Who, exactly, will be able to plan the rigours of a cross-planetary trek, bringing the Muppets' unique variety show to appreciative audiences around the globe? The gang decide to leave the task in hand with an oleaginous Tour Manager named Dominic Badguy (pronounced, a la the French, as "Badgee" and played gamely by Ricky Gervais). Little do they suspect that perhaps he has interests other than his own at heart. Badguy's links with a Russian criminal mastermind named Constantine, who has more than a passing resemblance to a certain singing frog, soon become apparent - but what, exactly, are his plans to use the Muppets? The most noticeable difference between this film and the Muppets prequel is Jason Segel. Entirely conspicuous in his absence, the joy and warmth Segel provides as both an on-screen presence and a creative force are much missed. In The Muppets, Segel's Walter provides us with a character to root for and one to empathise with - there's no equivalent in this film, a movie with ample screen time devoted to antagonists but little in the way of relatable human characters. Ricky Gervais, Muppets Most Wanted's nominal human lead, is hardly a like-for-like replacement for Jason Segel - the former's mucilaginous, cynical weasel act is almost the diametric opposite to Segel's sincere enthusiasm. The movie is thus skewered at a rather oblique angle. Amy Adams too, and the natural sweetness she brings to her characters, is an omission which costs The Muppets Most Wanted dearly - whilst charm pours from The Muppets with abundance, elated wonder is negligible in this peculiar sequel. All of this would have been forgivable, to a degree, if The Muppets' latest outing had managed to maintain the rapid-fire gag success rate of its prequel. Sadly, it does not. Whilst Bobin's first film breezed along, here it labours. An FBI and Interpol agent have a game of one-upsmanship in which they compare badge sizes - a set-piece deemed worthy enough of a highlight to make the trailer. Beyond this, recalling jokes in a movie I saw a scant few hours ago is proving to be a rather difficult task. Soundtrack-wise, the heights of "Man or Muppet", "Life's A Happy Song" and "Me Party" are never matched here - when Celine Dion turns up for a duet, its not entirely obvious what the joke is. Celebrity cameos in and of themselves aren't funny - the over reliance of them in this film is damning.